Julie Garwood triumphed with her phenomenal For the Roses and her #1 New York Times bestselling trio of novels, One Pink Rose, One White Rose and One Red Rose. Now, she brings her irresistible and heartwarming wit to a delightful love story featuring the unforgettable frontier family, the Claybornes of Blue Belle, Montana. Cole Clayborne had always walked a dark path and flirted with a life of crime. While his three brothers chose to settle into married life, Cole rebelliously refused to be tied down. Now, an elusive stranger draws him into a shadowy chase that will bring unexpected turns to his uncertain future - and may determine which side of the law the restless Cole favors. A tragic, heartbreaking loss drives U.S. Marshal Daniel Ryan on a quest for vengeance - and leads him to a beautiful young woman, the sole witness to a terrible crime. But the lawman finds that love is the greatest trial of all as he unwittingly draws her into the line of fire. 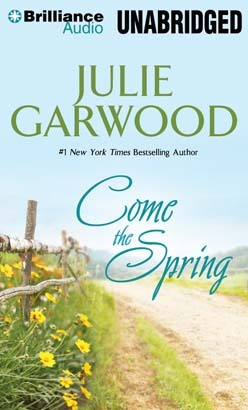 The power and drama of their blossoming passion, entwined with the surprising destiny of the wayward Cole, make Come the Spring a superbly entertaining adventure inside the heart of "a family whose love and loyalty will truly inspire" (Romantic Times).